While you’re exploring and digging around (see Tutorial 9) how about we set up a military? You’re going to need one, goblins are pesky bastards and likely to bother you more and more (if they haven’t already). Soldiers can be a bit fiddly to manipulate, but once you get the hang of it you’ll find it second nature. The first thing you will need to do, fairly obviously, is draft some dwarfs into your military. There are a few different strategies for this. First up, you can pick complete newbies and let them work up their skills and strength through sparing. Another strategy is to have some peasants work on screw pumps to quickly build up their strength and toughness before drafting them. Others like to use miners (which train up quickly and are thus easy to replace) as they usually are quite strong and tough already. As a further consideration, some don’t like to recruit women as soldiers. When they give birth it’s not uncommon to see them running into battle carrying a baby. This is both somewhat alarming and somewhat risky as you’re going to have potentially dead babies on your hands due to combat, something that might cause a lot of emo among your dwarfs. Hit “m” for the “military” screen. Scroll to one of your no-life peasant dwarfs, hit “enter”. Now when you move your arrow you will see the peasant is marked and there’s an arrow to chose another dwarf. Chose another pleb, hit enter. Scroll, chose another dwarf, and hit enter again. Hit space to stop promoting. We’ve created our first squad. Chose another spare peasant, hit enter to promote and then choosing two more dwarfs, create squad two. Scroll to the first squad leader, hit “a” for activate. Scroll to the second squad leaders and “a” activate him as well. Scroll to the top of your military list, your squads are now up there with their names in grey. On the first squad leader, hit “v” for view squad. If the squad is “on duty” hit “t” to stand them down. Hit “f” for “Food carried” and they’ll go get backpacks and put a stock of food in them for long duties. Leave other settings and repeat for squad two. With the military screen up, hit “w” for weapons. You now have a field you can move around using the arrow keys and cycle using “enter”. Leave the dwarfs unarmed. Scroll to the first “A”, which is for “armor” and hit “enter” until the field shows “Lth” for leather. Then go to the next column and hit “enter” until you see “Shd” for shield. Sparring unarmed trains “Wrestling” which is very handy, as it builds the key stats (like all training) but also trains quickly. Wrestling Hammer weapon skill is the skill used by crossbow dwarfs when out of bolts. Yes, they bash the enemy to death with their crossbows. We can train hammering latter. Wrestling helps when an enemy disarms your dwarfs as they have to fight unarmed then, and yes, a few enemies can disarm your lads. Finally, picture newby dwarfs with no skill training with razor sharp steel battleaxes. Yes, picture a few graves. Wrestling gets them tough enough to spar with decent weapons without a lot of weapon access micromanagement in the stocks screen (ie. forcing them to pick up wooden weapons and later on dropping them in favour of proper weapons). One thing you might want to think about is providing food and drink and somewhere to eat close to your military dwarfs. That way they will hopefully spend more time training and less time walking! Here’s how I set up a small dining room and a small food stockpile. Note, the whole area is outside – I’m hoping that some regular exposure to the sun while the soldiers eat will prevent them getting too cave adapted. I’ve had to roof over the bit with the tables and chairs though, those need to be placed inside. You can “b”, “C” construct a ramp in the outdoors area and then “b”, “C” construct a floor to cover the area (you go up a level, build a floor over the space, and it thus becomes a roof). But we will cover some of this in another tutorial as well. …hmm, actually, I have so many bloody dwarfs I’m going to put each squad up to four members each. That means we’ll have up to 8 dwarfs sparing at once, good stuff. To add more dwarfs, go to the military screen again, hit enter on the leader and then chose a dwarf to add to the squad. Note: It’s possible to end up with really convoluted command structures by accidentally making the boss of one squad the boss of another squad. This is annoying and pointless, as far as I can tell. To fix it, chose the problematic squad or person, hit enter on them, and then hit enter again. Hopefully that will remove them back up the chain of command. Or, hit enter on the boss and then enter on the dwarfs 2 steps down, that will pull them back up to being directly under the boss’s command. While the boys are sparring go to your leather workshop and make sure you’ve got some backpacks, armor and helms on order. You can check your stocks too, to make sure there’s enough kit to go around. In time we’ll get our lads into steel chainmail and plate, but for now, we need to get them into leather, and yes, armor does stack later. A nice addition to your military are some war dogs. How do you get war dogs? Easy! Find a space in your workshop and “b” build a “k” kennel. Note, this is a big building, so you may have to free up some space to place it. Then ensure you have someone with the animal training labour on (so it gets built and so you will be training animals). Then, go to the kennels using “q” and hit “a” for add task and then “w” for “Train War Dog”. Hit “r” to set the task on repeat. Hopefully all the adult dogs will now go about being trained. You’ll soon start getting messages like “An animal has become a stray war dog”. Good! Hit “m” to bring up your military. Hit “c” to look at a soldier. Hit “e” for “Work Dogs”. Hit “r” to assign a dog to that dwarf. Once you have enough trained, assigned one each. You can also train hunting dogs at a kennels and they are quite handy for hunters, since they too have the “ambush” skill that Hunters use. I don’t usually bother with hunter dwarfs so wardogs is all I want! Hordes of the buggers! Oh, a note on caged animals. Cages, when built (“b”, “j”), allow the assigning of animals to them, and can be set as a zoo room. Dwarfs enjoy relaxing in Zoos and looking at animals they like (happy thoughts). Consider building a zoo near the dining room. When placing cages, if you already have animals in them, hit “x” to expand the view and chose the exact cage you want to place. Here’s my zoo, where the old housing used to be before we moved it all down stairs. So your boys are training, tearing each others clothes off, putting each other in arm bars and whatnot. It’s all very ancient Greece, don’t you think? But anyway, if you use “v” and look around your soldiers, hitting “g” for General, you should see their skills climbing. Use “alt”+”arrows” to see the full range. Let them keep this up until they become champions or heroes. At this point they will no longer accept work dogs and become impossible to assign other jobs. The good news though, is that champions will actually use artifact items! Yay! So, let them train and while that goes on, keep digging as per the last tutorial. Grid up all the digable space on the various levels and find gems, ore and a special surprise! You’ll know it when you find it, you’ll be alerted by DF’s equivalent of a popup. We’ll cover what to do with your special surprise later. If you come across it put a door on the passage to the surprise and leave it until later. Ok, lets assume your boys have trained up to pretty damn good wrestlers, getting very tough and agile in the process. What’s the next step? Well, we’d like them to use chainmail, right? We could set them right into plate, but plate slows them down if they aren’t very good armor users (they won’t be yet). Chain will be just fine. Hopefully you’ve build a good pile of steel chainmail, helms, shields, grieves and whatever else you can see on the list. Now it’s time to assign. At the same time you’ve set a lot of steel warhammers to be built, right? Good! Go to your stocks menu under “z”. You should now see all your stocks updated by your bookkeeper, handy! Find the “weapons” first. Scroll through and look for any other sort of hammer. Chances are “steel hammers” are all you have. For good measure, set everything that looks useless (ie, not an axe or a pick) to “m” for melt. Or put that trash into weapon traps. Go to the “armor” list (and subsequent clothing lists) and look for chainmail. Any chain item that isn’t steel chainmail set to “forbid” using “f”. Now your boys won’t go picking up the rubbish when you change their armor setting. Make sure you’ve got enough suits of chainmail armor, steel shields, helms, etc, to equip your lads. Or near enough. If you’re unhappy with how your armor settings turn out, set everyone to no armor and once they’ve dumped all their items, go back through the equiping process again. Now, you can go to the “m” military menu and hit “w” for the weapons and change them from “Lth” to “Chn” and the weapon to “Ham”. Your dwarfs will rush off, grab a warhammer and throw some steel chainmail on top of their leather armor, great! If a few of them get to be awesome armor users you can change them to plate and they will even put the plate on top of their chain on top of their leather. A tiny, cute, drunk, ball of fury! Go to a squad leader, hit “v” (NOT “a”, that turns them back to peasants – but “a” again will turn them back to squadies). Hit “t” to make the squad respond to orders. hit “z” to zoom to the commander. I then go to the level and place I want the squad to go. Hit “s” to station the soldiers there, or hit “p” to place a patrol point and then move your cursor around and hit p again to place another point (and keep hitting “p” to place more). Your soldiers will now stop what they are doing and rush to the station point. Sometimes it’s a good idea to set it in a safe place first, so you can at least get a few moving all at the same time. If you just drop the station point in the middle of the bad guys you risk your lads charging in one by one. There’s a lot of ways of handling military, and we haven’t even covered crossbow weilding marksdwarfs, multiple weapons, archery targets, or any of that stuff. For now, go and build your military and come back for the next tutorial where we’ll round out your Dwarf Fortress lesson with some thoughts on magma, construction and fortress design! Thanks for reading and please let us know if you have any feedback. This is wrong, AFAIK. I’ve always heard that they use the hammer user skill. Woops! You’re right, of course! Wrestling only matters if they lose their weapon. Hammer skill is useful when they are out of bolts and want to bludgeon the bad guys to death with their crossbows! Wrestling skill does help in dodging melee attacks though, at least until the next version comes out. The next version is going to completely revamp combat and the military. Unfortunately by the time I got my wardogs trained there was only one slacker that hadn’t achieved champion status. I suppose I could just give him a ton of war dogs. This also was slated for fixing next version (I think). You can get around the 2 wardogs per dwarf problem, though. Simply get the dwarf you wan th the dogs assigned to do the training and the newly trained dog will follow their trainer around without needing to be assigned. Slightly confused, when I press m, everyone was already in a squad. Wat do. They are, by default, all one-dwarf squads. Even when not drafted at all, ever. By promoting some dwarfs to squad leaders, you make their squads biggers, and other disappear. It’s not very elegant, just a way to prevent dwarfs from doing absolutelly nothing when you panic and assign everyone without promotions. War dogs are kinda useless if you have champions though. Your champions are likely agile enough that they always outrun them. And they really should be quite hard to kill if you’ve made sure to teach them to wrestle first. While they make decent canon fodder, they injure easily and will limp after your dwarves while intermittently falling unconscious. They might be better bodyguards for your VIP civilians since they can buy them time to get indoors. Any advice for training new recruits without having to disarm all the weapon holders? Will the hammerdwarfs kill the inexperienced unarmed newbies while sparring? New recruits should train wrestling and armour wearing first, that should skill them enough so that when they train with weapons they don’t get themselves killed. Alternately, give everyone the gear they need and work on the principle of survival of the fittest! Not pointless at all, though it is possible to eff up your command structure. I love this guide! I tried DF a few years ago, and couldn’t get past the ugly graphics and complex controls – you’ve made it simple, easy, and elegant. One question, though: How often do you get immigrants? So far I’ve been playing my fort for over a year, and not ONCE have I gotten any. It’s rather frustrating, though the 7 dwarves I started with are all getting massive amounts of experience from having to do everything themselves. I think the game is monitoring my keystrokes… Not 5 minutes after making that post, I got a FLOOD of immigrants. I went from 7 to 29, and had a hell of a time accommodating them all. Luckily, I had just finished carving out the dorms and was in the middle of furnishing them when they all arrived. At least they had rooms! Haha that’s awesome. Also, a more decorated (read, valuable) fortress attracts more immigrants sooner. Do some smoothing and engraving of walls, chuck some statues up around your dining room and they should come often and reliably. I think that’s why I got so many in my second spring – I found a way (on the wiki) to convert all of that platinum lying around into statues, without smelting it first. Fortress value went from ~30k to well over 200k in about half a season. Also, I bought a couple of cats from some traders, and can not figure out how to get them out of their cages! I couldn’t find out how on the wiki either. I’m guessing there is some obvious thing I am missing… Could you give me a tip? Some recent comment on one of the tutorials was about getting cats out of cages. Mm which one?! Don’t worry if other dwarfs use the dining room. In time you will hopefully have two or three, each next to a pile of food and handy to work and living quarters. Dwarfs will end up using the most convenient. Alright then, I’ll look for that other comment. Thanks. Ah, as it turns out, the other comment (on the last tutorial) didn’t specify how to release a cat, just how to buy one in the first place. I managed to figure it out with the Bay12 Forums. It turns out that you have to “build” a cage that is made of the same type of wood close to your current animal in the stockpile. A dwarf will go retrieve the closest cage made of the wood you assigned, which should be the one with your animal in it, and move it to where you “built” the cage. Then you can use “q” over it, hit “a” for “assign,” and hit “enter” to deselect the animal assigned for that cage. 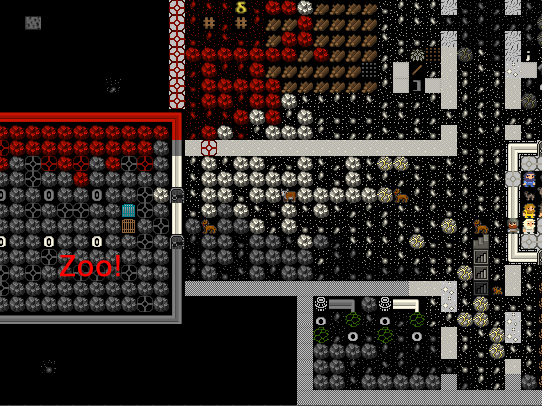 A dwarf will promptly release the animal. Then you can deconstruct the empty cage and return it to the stockpile. Carp eh? What about the Pike, I ordered a bunch of waterskins made and set up my military to use them figuring they would just fill them with booze and continued going about my business. Then I got a message Lokum Muthkatlogem has entered a battle trance which prompted major WTFing from me since I didn’t get an ambush message. I went to the unit screen and zoomed in on her she had been attacked by Pike while filling her water skin started to engage them in hand to hand combat fell in killed one then was killed by Oslanrigoth, Pike who is now swimming around in dwarf chunks. Now this gal was no pushover she was fully clad in Iron Chainmail and was one rank below Legendary Wrestler status. This. Is. Dwarf Fortress! Great story, thanks. Up to now your tutorials have been very clear. However, when I went to the military screen, the UI differs from what you described it to be. Has DF 2010’s military menu undergone a massive update? Extremely massive. I find it confusing, as do a lot of other people. All I can suggest is checking out the wiki! Whoa! Quick reply! This game’s community is just simply awesome. Ok checking out the wiki since Catpnduck’s videos show the same outdated UI. Any chance of an update? Now I have a 1yr old… maybe not for a while?! I’ll probably do another series once there’s a major upgrade of some kind. I understand. I’m married too. RL first before DF haha! This game and the community’s guides are awesome. I think the new version of DF (that’s v 0.31.14) has a weird military structure. I can’t seem to sort it out and adapt it to the new version. The controls and buttons are all different for the new version. If you’re playing the new version all I can suggest is pouring over the wiki and looking up other tutorials and guides on the DF Forums. The new military system is a little confusing when the menu system is all in ascii! Haha thanks for that! Will fix soon. I am no expert in the new DF. I would google the dwarf fortress wiki and look at the pages on the military. It isn’t easy! Hey, my dwarf manager seems to have stopped working. I open it and hit “Load from DF” but nothing appears. I recently deleted and renamed my save files so that i could actually find my most recent save. I tried installing dwarf manager again but that didn’t work. I tried dwarf therapist but that did not work. Bugger. I have no idea why it would just stop working. I think you should perhaps warn of this ‘special surprise’. It’s not clear whether we should continue digging or not – I made the wrong decision and… well… you known the rest! Thanks a ton for the guide, but I’m having a problem. When I go to build a roof over the dining room for my military it wont let me place a roof piece over some places because it’s blocked by something. Any idea why? I have no idea what could be blocking it. When you are building floors (roofs) you can’t build them on top of the tops of walls. Only more walls can go on top of walls. Build the floor out over the empty space but touching the wall top along the edge and you should be ok.
My military isn’t training in the barracks help?!? Ok, this is weird. Lately I’ve geen getting loads of ‘[insert name here] cancels store Item in stockpile: Item misplaced’ warnings. But just then, after part of the roof collapsed, (I’m mining the roof above my Military area), it came up with about 9 or 10 of them at once. I’m not sure if they’re related or not, because some of the warnings have been coming from places far underground, nowhere near the military area. What’s going on? Also, how do I deal with Ghosts of dead dwarves?